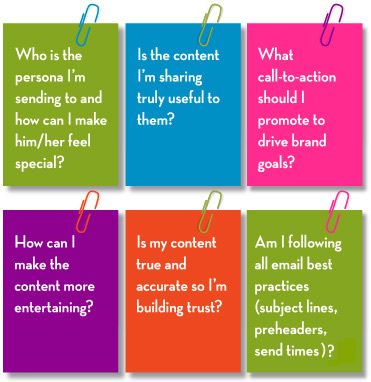 Home > Email Ideas & Best Practices > How healthy is your email strategy? How healthy is your email strategy? Admit it, you’re addicted to your own inbox. You check your email constantly… often surreptitiously on your phone when you’re on a date, at your kid’s soccer game, or in the grocery store. But why do some emails connect and get your attention while others simply annoy you? If you’re like the rest of us, you probably experience a spectrum of email engagement, ranging from those you delete as quickly as possible (maybe with an angry “argh!”) to those you enthusiastically click and share. So how do you make sure your emails land further to the right on the spectrum above so your subscribers shift from barely interested, to fan, to advocate who shares your information with his or her network? Ensuring your emails look and work great is priority one, but once you’re well branded and fabulous (and following email best practices, of course), the single most important thing you can do is create and share relevant and engaging content. But the fact is, 2.5 billion pieces of content are shared each day. 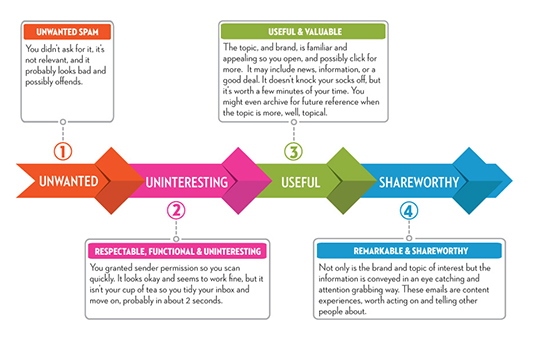 So to reach shareworthy, your content must be credible, interesting, entertaining, useful and customer-centric. Checking the boxes above is a must if you want to move your subscribers along the path from barely interested to fans to advocates. Brand advocacy has been called the “holy grail” of marketing and the “phase of the future,” in large part simply because consumer-to-consumer recommendations are more credible and actionable than traditional advertising. So using email, a well established and trusted medium, is an important part of this move. The truth is, while marketing channels are ever-changing, and even those declared “dead” are alive and kicking, there has been a trend from one-to-many marketing tactics to many-to-many tactics. Email is an important part of the shift towards consumer-to-consumer advocacy. And while good marketing communications professionals are increasingly focused on telling compelling stories, ensuring your stories are shared is still a noble, and common, goal. And although we tend to associate “going viral” with social media, the email forward is an even more powerful influencer. One study suggested that “although more consumers are reached through [referrals via] Facebook, email results in greater response.” This is no doubt in large part because forwarded emails are more personal and most people pay at least passing attention to every email in their inbox whereas our we attend to social platforms more haphazardly, viewing only small sections of our timelines when convenient so they’re simply less actionable. Social sharing is great at expanding reach but email forwards excel at driving conversions.